I have no clue where this week went, and I have no clue how it's possible that we will be in October in a matter of no time. I'm happy to be checking in with all of you today, and if you've wondered what else I've been up to this week, please do check my Dissecting the Details contributor post over on La Dolce Vita blog. 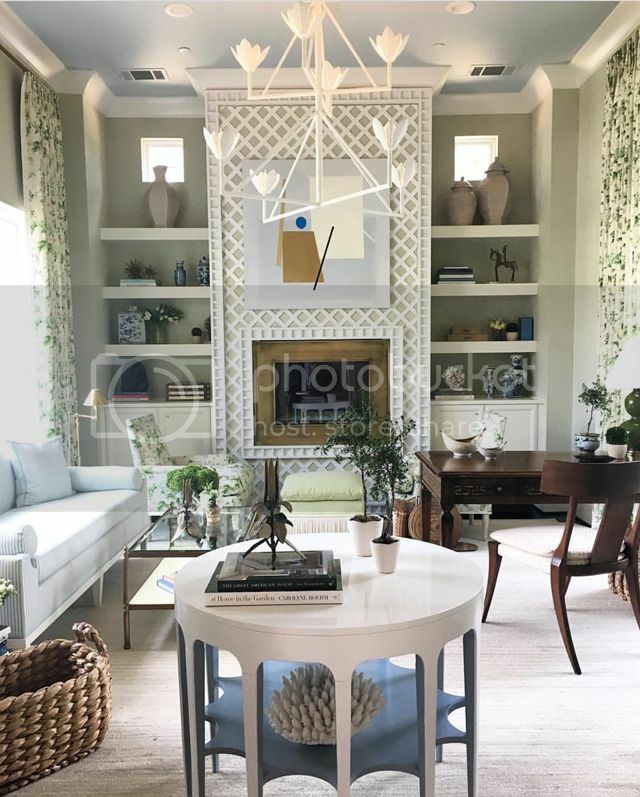 I've focused on the glorious living room designs by Kevin Walsh of Bear Hill Interiors, and I'm starting off my favorite five with his design you see above - it's simply dreamy and is quickly going to be added to my 'dream home' files. Next up, my infatuation with Gracie wallpaper continues. 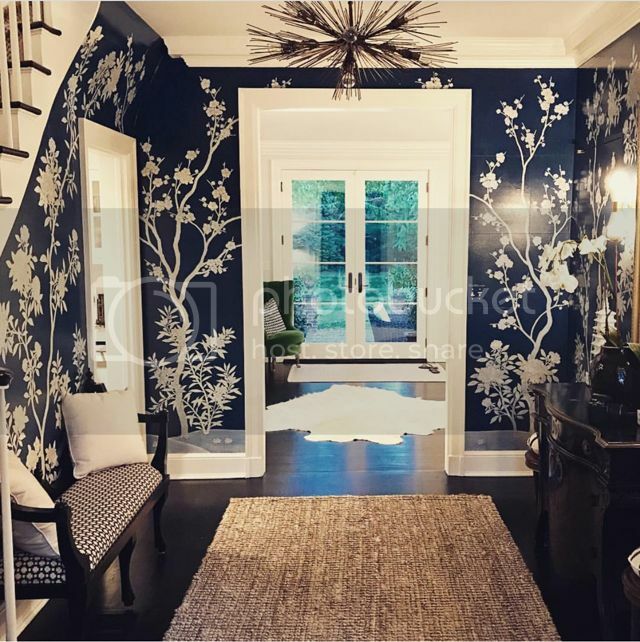 This example by one of my long time favorites, Christina Murphy, shows that dark and moody is a welcoming way to invite someone in to your entry way. I adore the glossy finish and the navy colorway. Back to dark and moody. 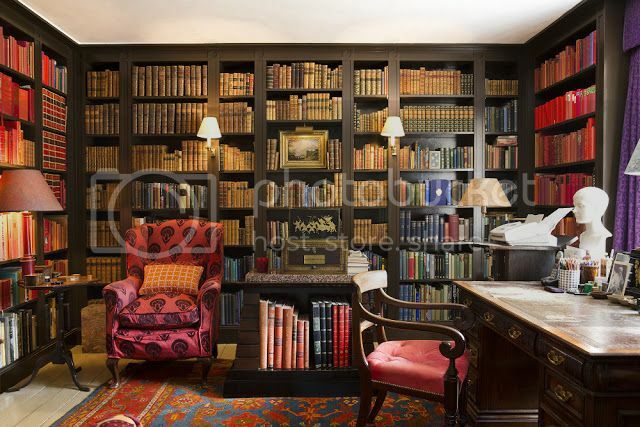 This next image shows a corner of a library in the J.K. Place in Florence Italy, and it just exudes style and coziness. 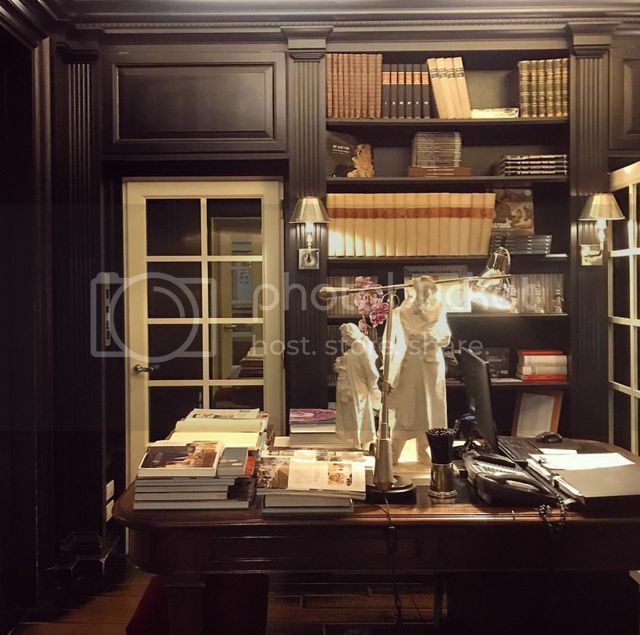 I particularly adore the shiny surfaces of the sconces and desk lamp against the dark wood (photo via Anna Spiro). Hope you enjoyed my quick round up this week, have a wonderful weekend! 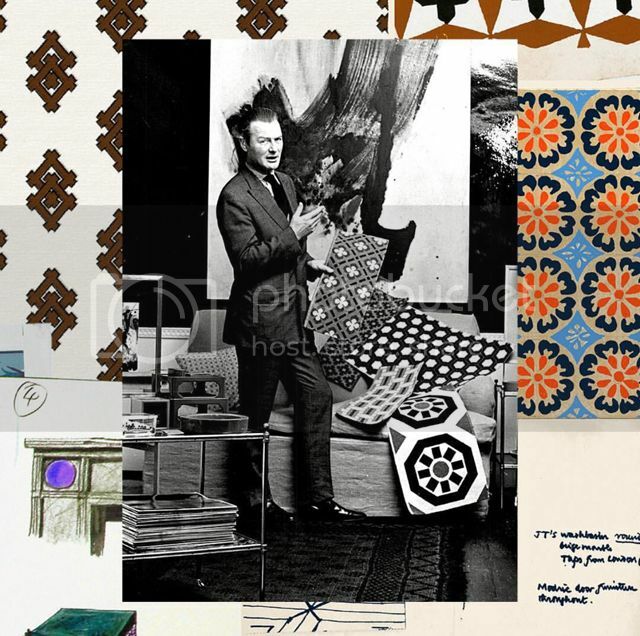 For decades David Hicks, the most celebrated designer of his time, documented every moment of his life in collage-style scrapbooks. 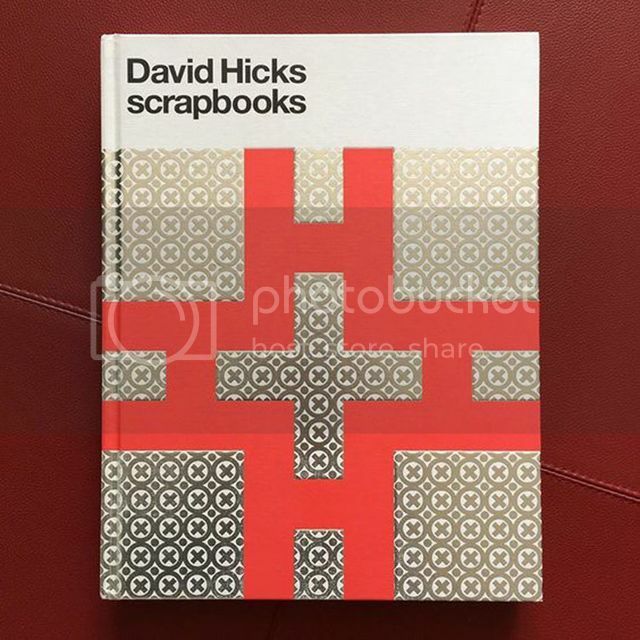 In this stunning compilation, his son, Ashley Hicks, has chosen over 300 of the best scrapbook pages to create David Hicks scrapbooks (from Vendome Press) set to release on September 26, 2017. I have found myself pouring over every detail of this book in the past week, it truly is a work of art. 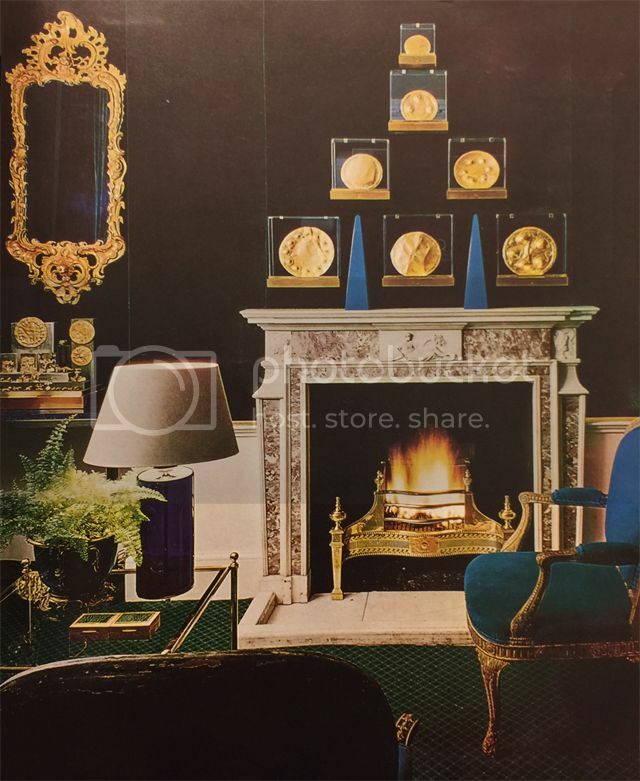 Ashley expressed that the hardest part was there are 25 scrapbook volumes in total, and "they are cumbersome, heavy things that are falling to bits ... I've always wanted to make a more accessible version of them for the family, and myself" (anothermag.com). The magical effect of this collection is the fact that Ashley meticulously photographed each page in natural light on his own kitchen floor, then very carefully colour corrected every faded image digitally. 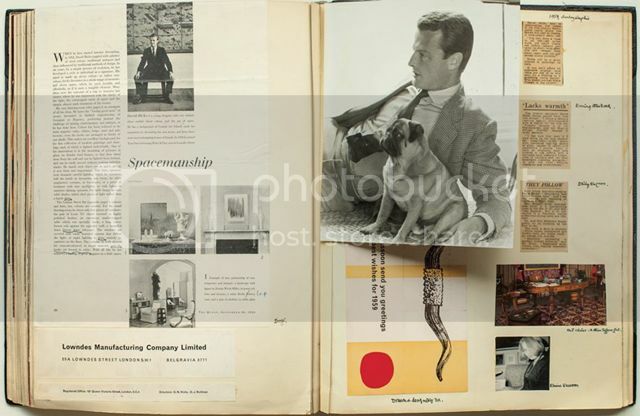 He explains, "I photographed my father's 25 scrapbooks in natural light so inserts like this [below] 1958 photo of him and his pug Algy have a trompe l'oeil quality in the published book." You can literally see all the way to the edges of the pages, making you feel as if you are holding the original copy. 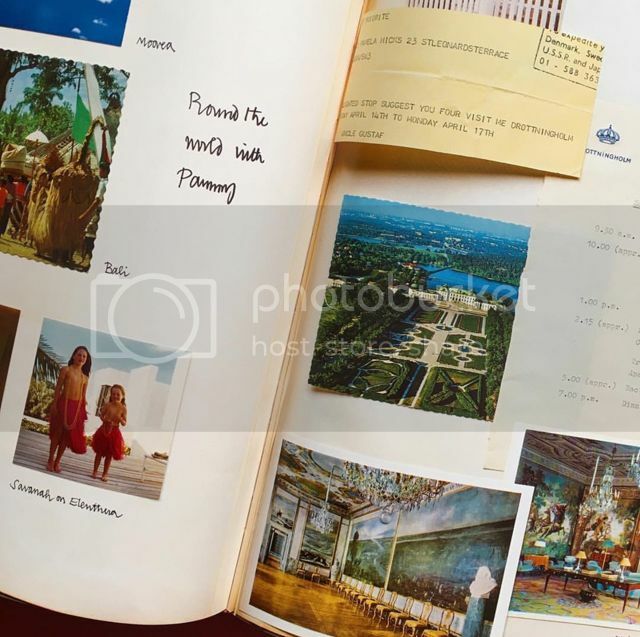 There are press clippings on his marriage to Lady Pamela Mountbatten (Prince Phillip's cousin), invitations to the White House, and notes from Grace Kelly. 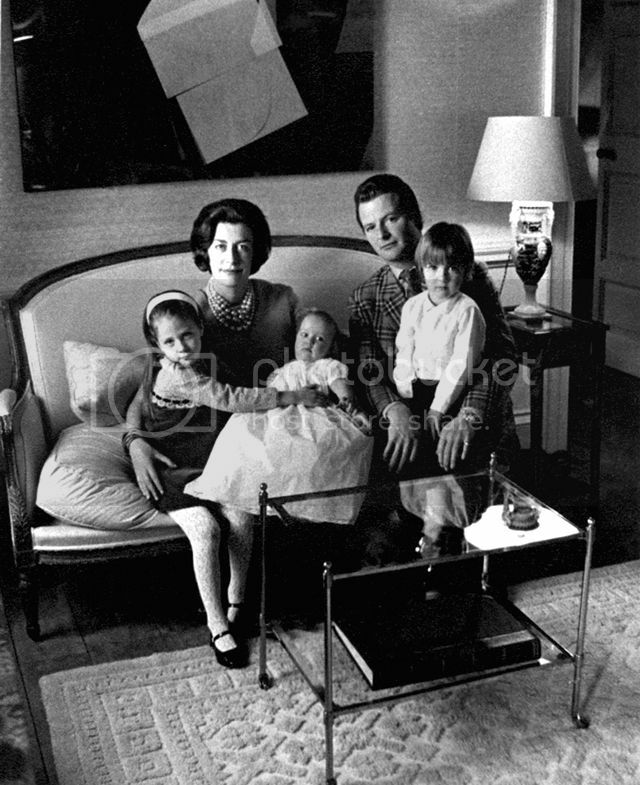 David included many family snapshots, and his own photos of people like Jackie Kennedy, and Andy Warhol. 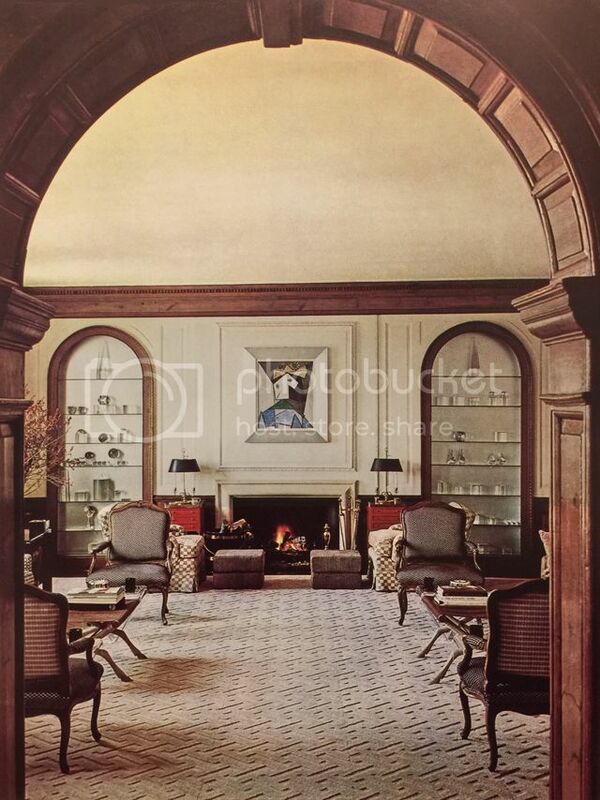 This blue room was completed in 1968, Hicks was truly ahead of his time. His quotes strongly resonate with our lives today - "Good taste is something you acquire. You can teach it to yourself, but you must be deeply interested. It is in no way dependent on money." Another favorite: "Fluorescent lighting has no place in the home." "I have always had a passion for what some people consider clashing colours. 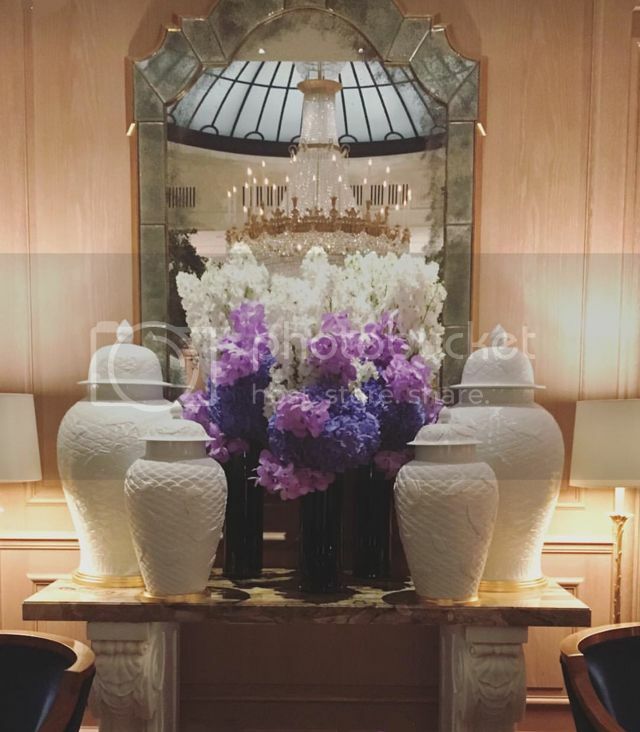 I call them vibrating colours ..."
We can see that Hick's work has left an impression on some of the most creative individuals today - Tory Burch does not shy away from admitting how much she has been influenced by his work. 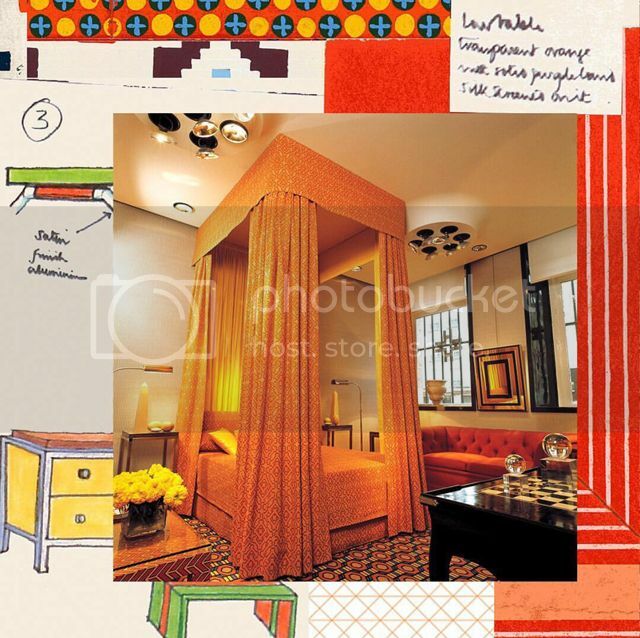 This bedroom below inspired the interior of the first ever Tory Burch boutique in Nolita (which showcases the same shades of orange). 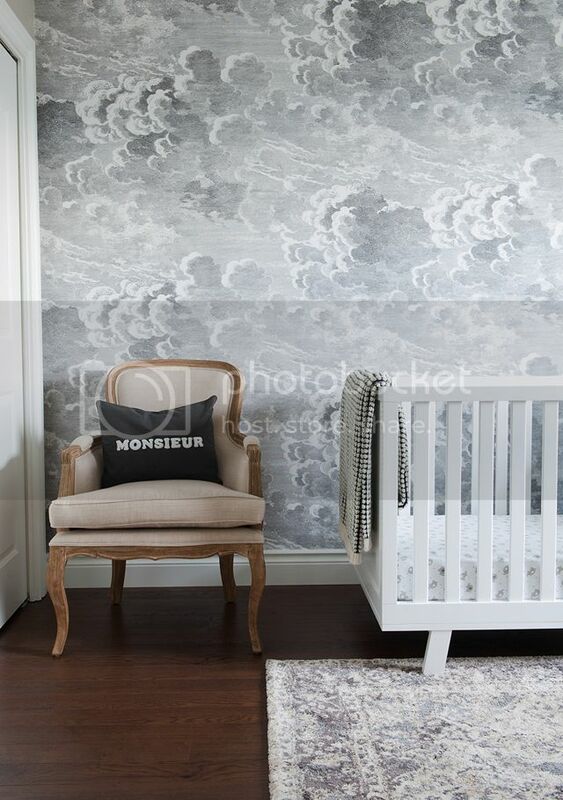 This one is truly a volume to add to your design library if you are a true design lover! You can pre-order your copy of this historic compilation here. It seems I subconsciously had a bit of a running theme in the favorite photos that I saved this week ... all included insanely fabulous wallcoverings. 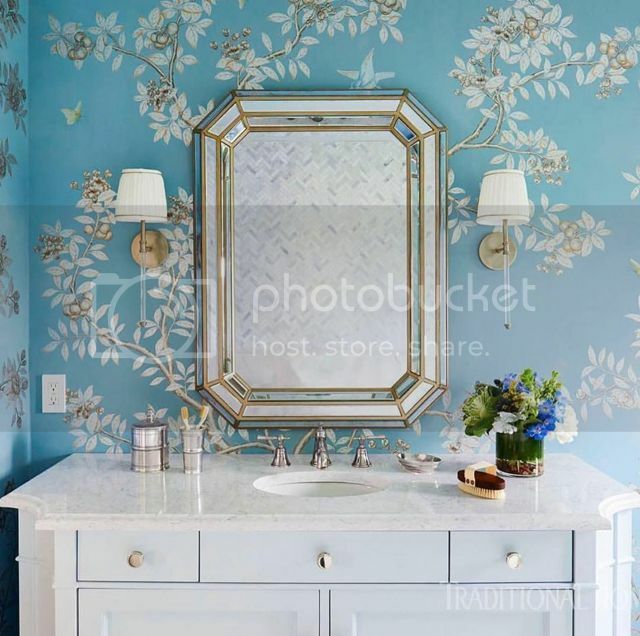 If you've noticed lately, I have had quite an obsession with chinoiserie wallpaper and murals, and these examples are no exception. 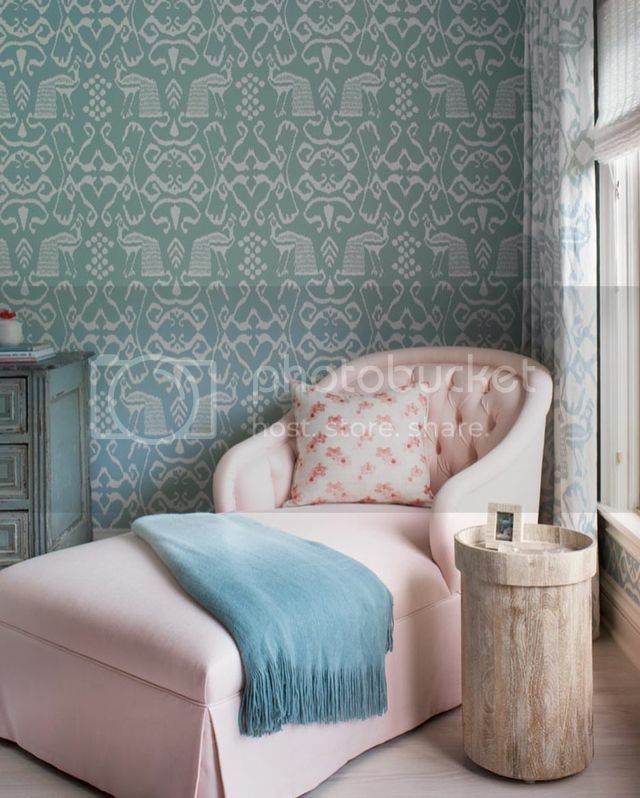 I love shades of blue and soft greys, very soothing for the bedroom or bathroom (as seen above in the stunning bathroom slathered in Gracie wallpaper - I will never tire of their handpainted works of art!). I love this pink and blue combo by Massucco Warner Miller! I'm excited to share that our home tour is featured on HGTV Canada's website today! I love the title they came up with and I find it very fitting: 'An '80s Vancouver Home Gets a Bright, Pattern-Happy Makeover.' 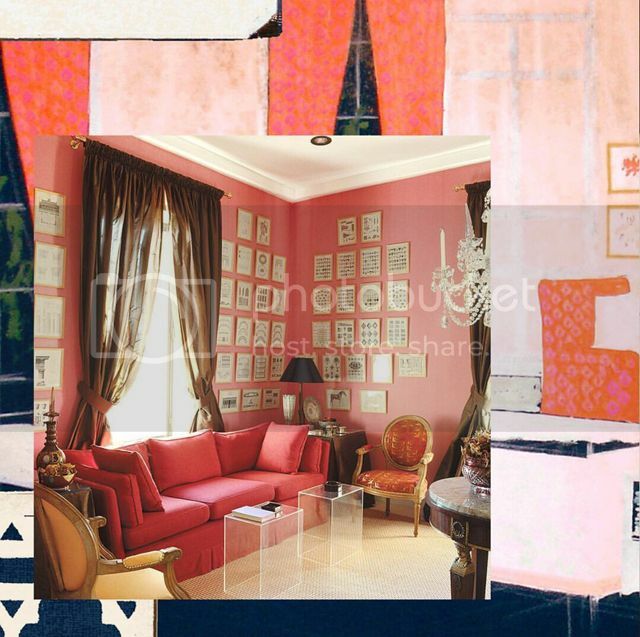 It's always interesting to hear how others perceive and analyze your own home - I thought, boy if only they knew how much MORE pattern and color I am planning to add and layer-in as I continue with these rooms and the rooms that have yet to be completed! 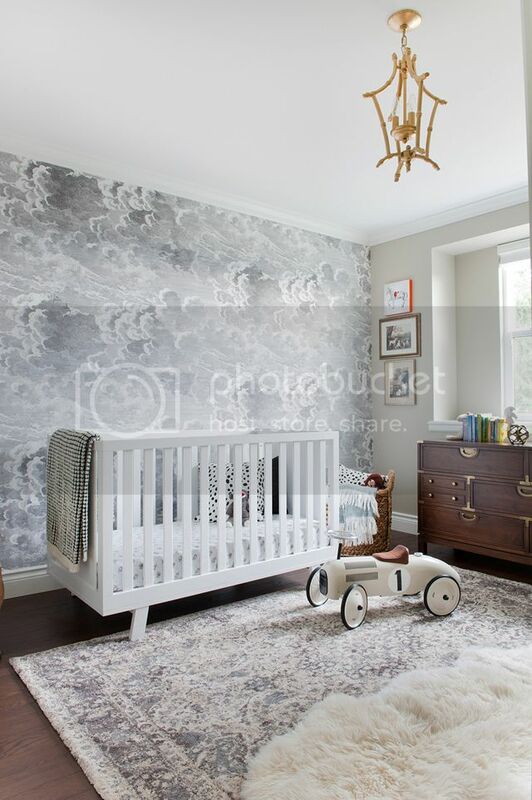 And while I know you've seen the majority of the images from the HGTV article on this blog, I actually haven't posted the updated photos of Marcus' nursery here. At the time of my One Room Challenge, in desperation to finish up I took photos myself. 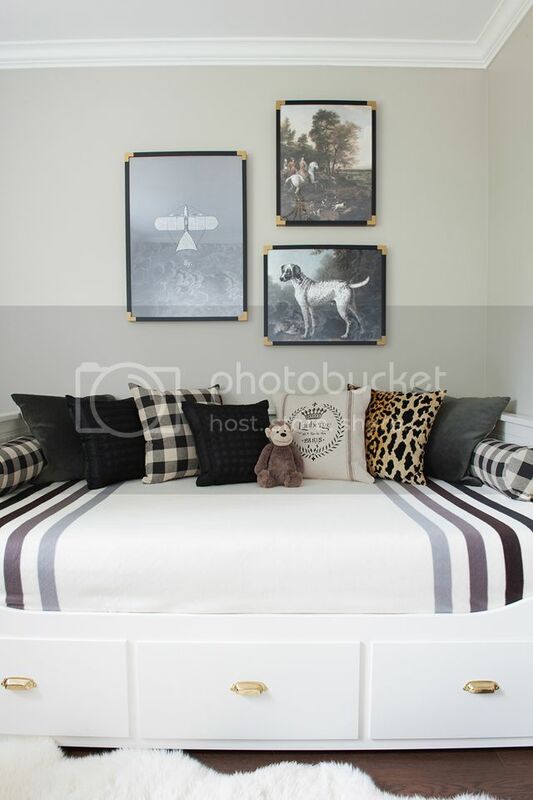 Having Tracey Ayton come in and take professional photography of all of these rooms, including a re-take of the nursery, was such a huge blessing and I'm super thankful for her talent and fresh eyes to see the spaces in ways I hadn't before. 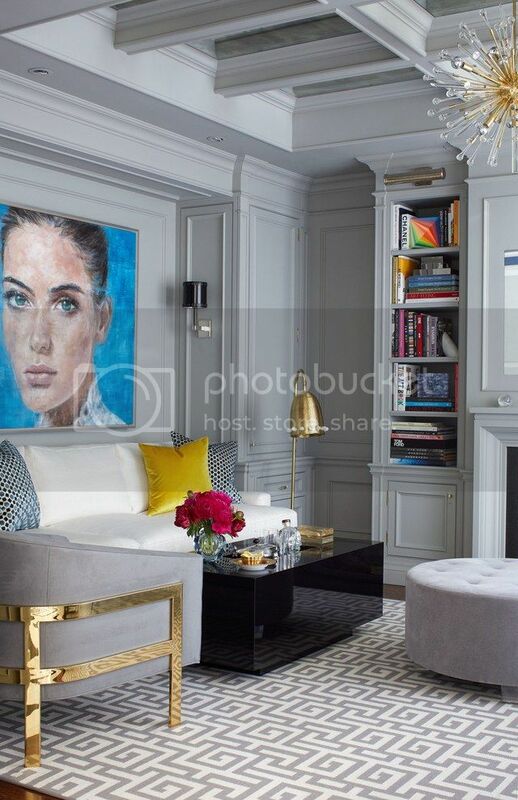 The article mentions that my home office (pictured as a closed door in one of the shots), is next on my decorating to-do list; the truth is it feels like SO many rooms are next on my list. Flooring and paint has been completed everywhere but we now have to decorate the Master bedroom, the upstairs hallway, and the family room. We still have construction/cabinetry needed in the Master closet, laundry room, and home office, and a FULL reno of the 1980's Master ensuite (the big-ticket item that may take a bit of time to save our pennies!). The exterior has had shingles replace the old tired stucco, but we have a bit more to do out there too. That's a whole lot more spaces to work towards and I look forward to documenting it all here with you. Happy Friday! Can you believe it's already Sept 8th? We are really diving into this month at full speed. 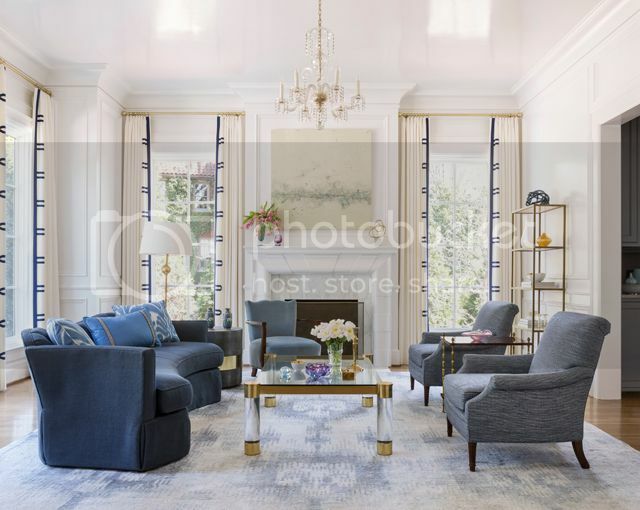 For this week's favorite five images that stopped me in my tracks, I'm starting us off with a project from Canadian designer Anne Hepfer featured in Architectural Digest this month. 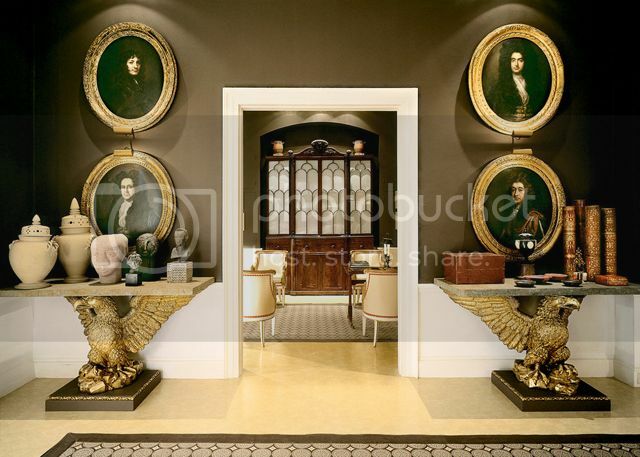 Just look at that brass frame on the side chair, and the antique mirrors installed in the coffered ceiling! See the entire Toronto home here. 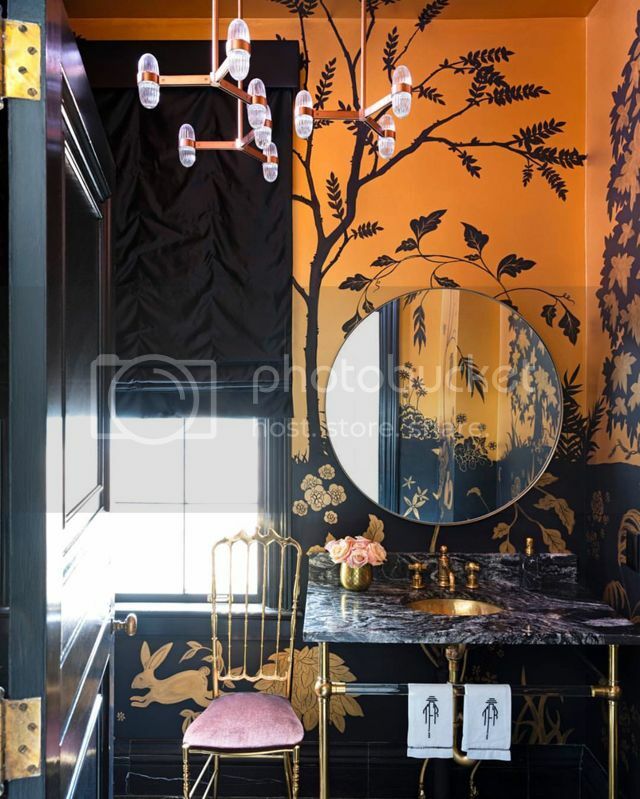 This powder room above was shared on Veranda magazine's instagram account this week; I loved that stunning wallcovering as well as the vanity and antique brass chair (very similar to mine that I scored on Craigslist here)! 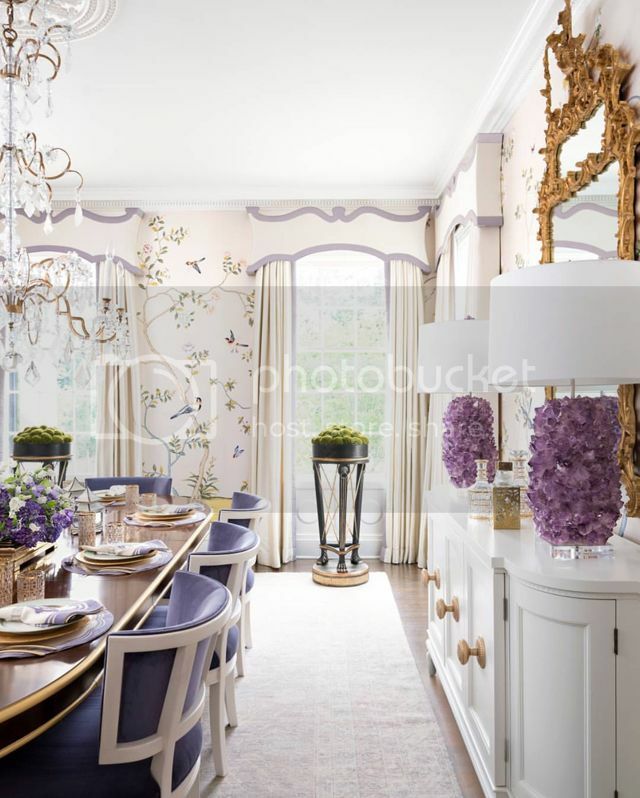 The table vignette picture snapped by Brynn Olson Design Group struck me for a number of reason: (1) I'm a sucker for symmetry, (2) those oversized ginger jars are incredible, (3) the shades of purple combined with white flower & the mix of hydrangeas and orchids looks insanely beautiful. Oh and purples are said to be the hues of fall 2017, so watch for that as well! 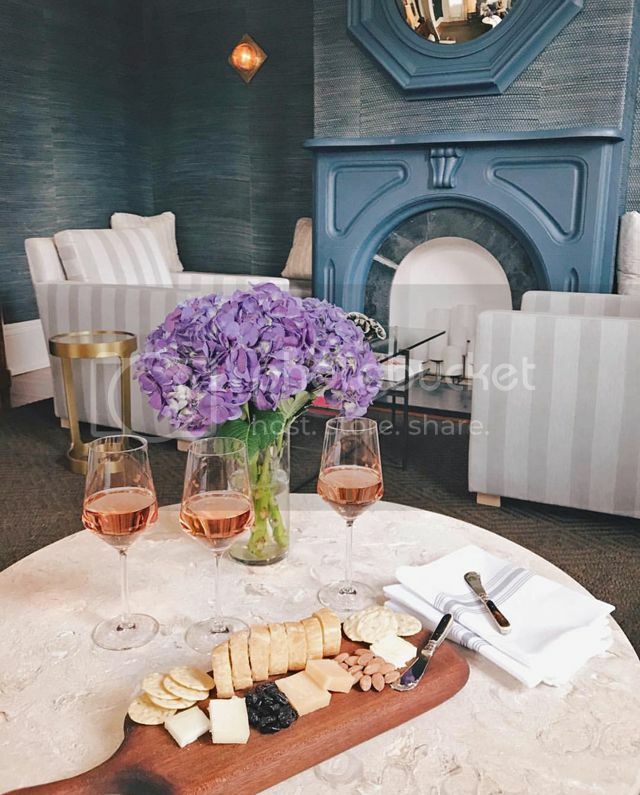 Verandah House can do no wrong, and these talented ladies has been sharing gorgeous details of their installs in the past week. 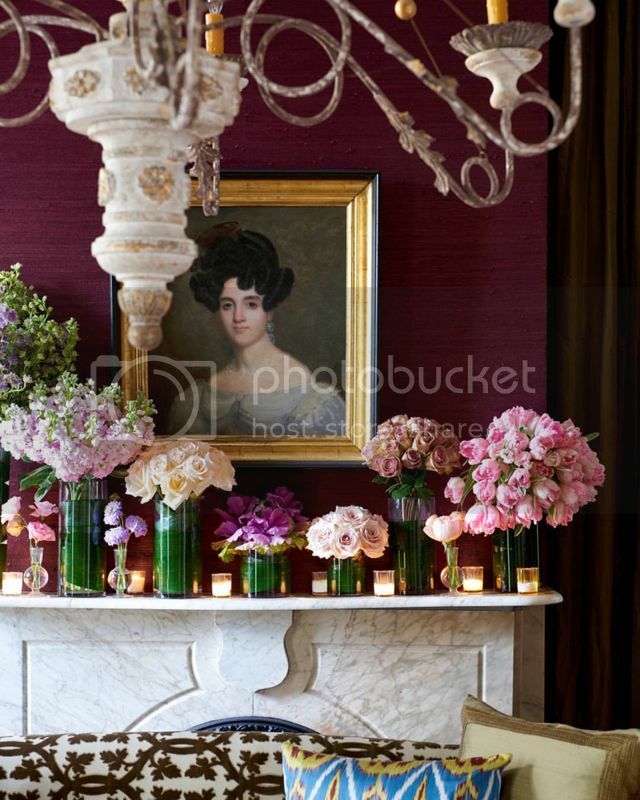 How lovely is this vignette? 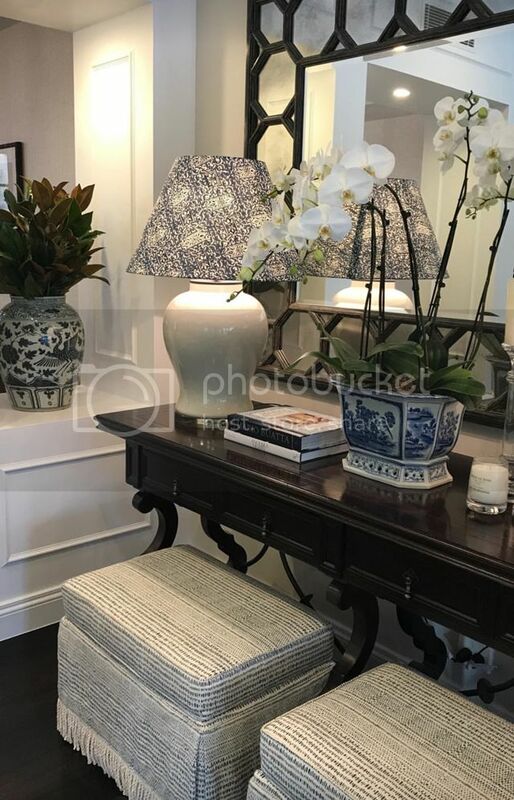 The blue & white orchid cache pot and the fabric lamp shade are my favorite details ... and the fringe on the ottomans ... and basically everything else. Last but definitely not least, I had to save this image from the recent issue of Veranda magazine. 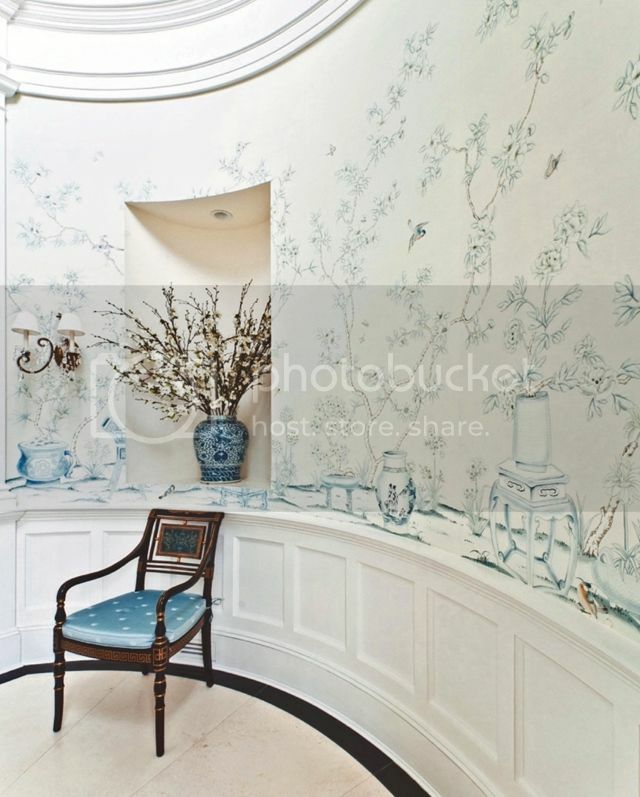 Designed by Melanie Turner, this in my opinion, is delicate use of color at it's finest. The wallcoverings, the purple details, and those beautiful moss displays all attract my eye. 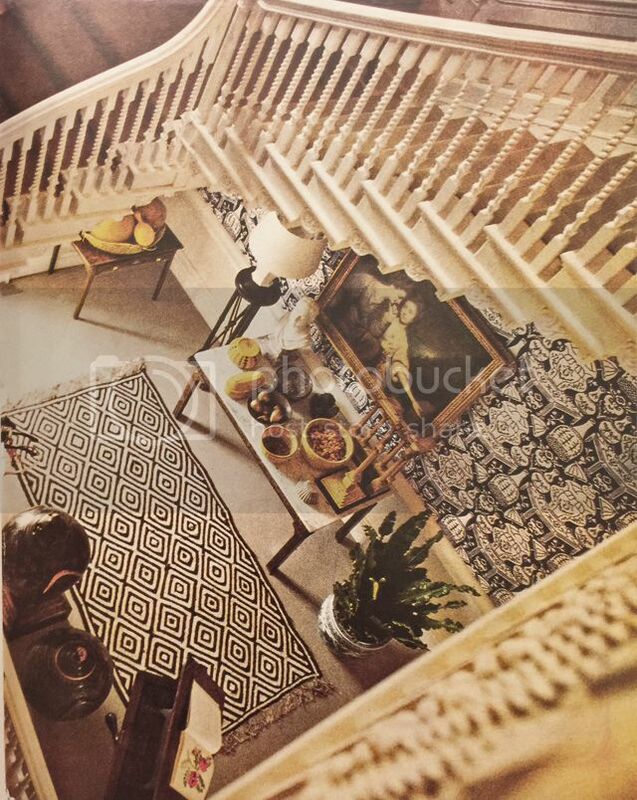 See the latest issue of the mag for the full home tour. Hope you enjoyed my favorite saves from this week, have a lovely weekend everyone!